Federal agencies will be closed on Wednesday to mark the passing of President George H.W. Bush. President Trump announced the closures in an executive order on Saturday out of respect for the 41st president, who died on Friday at the age of 94. Bush will lie in state in the Capitol Rotunda in Washington next week and the public will be able to pay respects from 7:30 p.m. Monday to 7 a.m. Wednesday; he will have a funeral at the National Cathedral. Federal agencies may order some offices to remain open Wednesday for national security purposes, according to the executive order. The Office of Personnel Management had not issued an operating status announcement as of late Saturday afternoon. Trump in a statement Saturday praised Bush for his entrepreneurial spirit and commitment to public service. 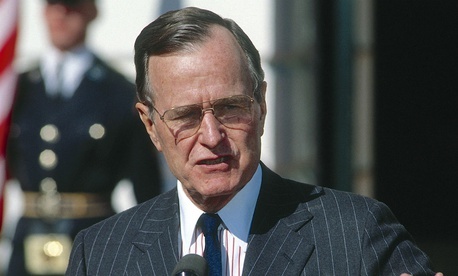 In addition to serving as president, Bush was a Navy pilot during World War II, member of Congress, ambassador to the United Nations, CIA director and vice president. "Even with all he accomplished in service to our nation, President Bush remained humble," Trump stated. "He never believed that government—even when under his own leadership—could be the source of our nation’s strength or its greatness. America, he rightly told us, is illuminated by 'a thousand points of light,' 'ethnic, religious, social, business, labor union, neighborhood, regional and other organizations, all of them varied, voluntary and unique' in which Americans serve Americans to build and maintain the greatest nation on the face of the Earth."